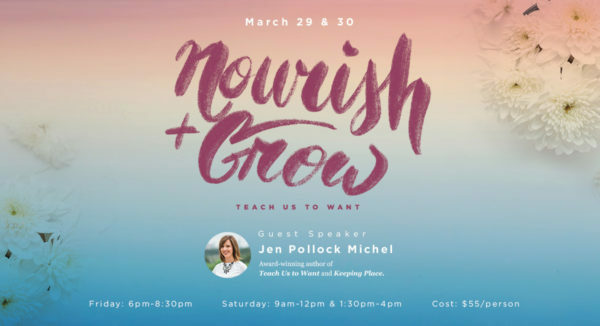 Mission Hills Church would like to invite you back for our Nourish and Grow Woman’s Retreat this March 29th and 30th. Our individual stories are set against a greater story: a good God creates us according to his good pleasure. The good God enters our reality and redeems us down to our soul for his good pleasure. Jen Polluck Michel invites us to boldly name and voice our desires and allow God to mold and recast them in the fires of his love and good purpose. Friends, haven’t we all walked in the valley between what is longed for and what is realized? Let’s come together, as Jen stirs us to recover and reshape our desires in the light of the kingdom of God. What if we could say with Christ, “thy will be done,” with trust, confidence, and ultimate joy. Event will be Friday March 29th 6-8:30 pm and Saturday March 30th 9-12 pm/1:30-4 pm.